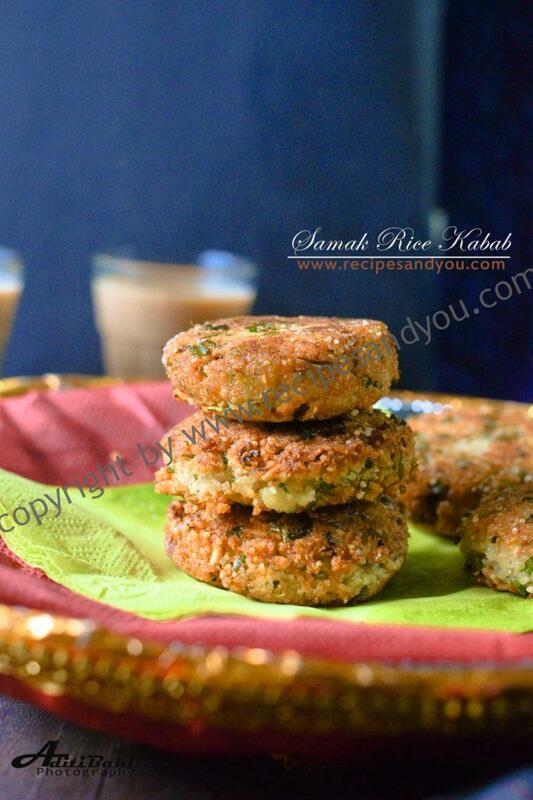 Samak Rice Kebab are kebabs made from samak rice/sama rice as they are called. Samak rice are soaked in water for a few hours and then mashed with potatoes and stuffed with paneer..It can be totally customized. You may even mash the paneer together with potatoes and rice. 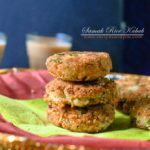 I made these with a stuffing of paneer and dry fruits and they came our super delicious.You can deep fry them.But i prefer shallow frying/ pan frying them with little oil,as i like to eat less oily food during Navratri. But its completely your choice.If you are deep frying them i suggest dry coat them with a bit of samak rice flour,its easily available these days.If you do not find the samak rice flour where you live, you may use water-chestnut flour as well. Just soak the samak rice into an equal amount of water for 2-3 hours and then drain the water and mix the rice with the potatoes and a little bit of samak rice flour or buckwheat flour,just to manage the little moisture from the soaked rice.And add the taste enhancers like, chopped green chilies, crushed peanuts, salt and fasting chaat masala. Yes we get a chaat masala here which is especially made for fasting days.It does not have regular salt and stuff in it and prepared with rock salt/sendha namak and its just yummy.I even store this chaat masala for the rest of the year as i find it a little subtle and more flavorful.I even use this masala in my dahi vadas and other things throughout the year.If you have trouble finding a Vrat ka chaat masala ,then you can just make these with black pepper powder and rock salt.Its still taste good. To make this recipe Vegan, just omit the filling of panner and make then with only potatoes. Fasting is a period or restricted cooking and eating but not in terms of Taste, but just in terms of ingredients.And you can do some amazing things even with the restricted diet.Look at some of the very interesting thinks and of course low fat and gluten free and few are even Vegan.Here’s a link: Buckwheat Dosa/Kuttu Ka Dosa, Navratri Mezze Platter, Sabudana Khichdi, Sabudana Kheer, Kuttu Ki kachori,Sweet ‘n’Sour Pumpkin, Vrat Ke Aloo ,and a few amazing dips- Tomato Chilli Dip and Peanut Dip which you can even eat as chutneys with your regular vrat food. Enjoy your Meals and do leave a comment. Soak the samak rice into 1/2 cup water for 2-3 hours. Drain the water after 3 hour and transfer into a bowl.Add boiled and mashed or grated potatoes and the rest of the ingredients in the list. Also if you feel the batter is a bit wet/sticky then add 2 tbsp of water-chestnut flour or samak rice flour. Mash the mixture nice with your hands and flatten with your palms.Make an indent in the centre for the filling and then put a small amount of filling inside. Close the pattie from all sides and make the kebabs like shape. Heat oil in a shallow pan, about 2-3 tbsp should be enough.Start frying your kebabs into the hot oil.Put the flame on medium high, to avoid getting cook very fast.The samak rice need to cook well before the crust getting overcooked.So cook on medium flame to avoid burning. Serve hot with Tomato chilli Dip or Peanut dip or any chutney of your choice.